Brown University medical student Jeremy Boyd leaned on the rail of Marian Thorpe's hospital bed and asked her about her collapse during dialysis. Then he asked whether she had any other medical conditions. "Do you have a long time?" asked Thorpe, 93. They discussed her kidney problems, colon cancer and gout as well as her allergies and family history. Afterward, Boyd stepped into the hallway and recorded the information on his personal digital assistant. Brown recently joined a growing number of medical and nursing schools — including the University of Michigan, University of Texas and the UCLA School of Medicine — that require students to buy and use PDAs. Faculty and students say the technology saves time and helps them provide better care, in addition to reducing medical errors. Drug references and diagnostic programs can be stored on the PDAs, giving physicians information at their fingertips. "Let's face it, it's impossible to get all this stuff straight in your mind and memorize it," said Art Frazzano, associate dean of medicine at Brown. The University of Rhode Island College of Nursing also began requiring PDAs this year for some students. One goal is to teach students the value of up-to-date information in a field that is rapidly changing, assistant professor Laurie Lauzon Clabo said. "If we had students buy a book, by the time the book hits the bookstore, it's outdated," Lauzon Clabo said. "With using PDAs, they can update their software weekly." Most students use programs produced by California-based Epocrates Inc., which specializes in medical software for handheld computers. It provides its Epocrates Rx program free of charge. The program tells students about drugs' use, generic equivalents, appropriate dosages and possible interactions or side effects. "There's a ton of information in here," Boyd said as he scrolled through the file on acyclovir, a drug used to treat herpes and chicken pox. For $150 a year — and many students get a discount — doctors and nurses can subscribe to Epocrates Essentials. The software includes the drug program as well as Epocrates SxDx, which provides information on diseases and their symptoms, and Epocrates Lab, which helps the user interpret test results. Twenty-eight percent of medical schools require students to have PDAs, according to the most recent survey by the Liaison Committee on Medical Education, the schools' accrediting organization. Many more students use them voluntarily, according to Epocrates' research. The universities' requirement reflects what is already happening in the field, said Lauzon Clabo, who started using a Handspring Visor half a dozen years ago while working on her doctorate. Then she started teaching in hospitals and saw residents and interns using medical software on their PDAs. Lauzon Clabo was hooked. She has a Palm Treo now that she uses to keep herself organized, look up medical information and transport slide shows for her presentations. "The uses are almost unlimited," she said. Half of all physicians owned a PDA in 2004, according to the most recent survey by the American Medical Association and Forrester Research Inc.
Thorpe and her 46-year-old granddaughter, Joanne Schondeck, said many of their doctors now use computers — handheld or regular-sized — to track their information. Schondeck said she hopes that will reduce errors, such as when a doctor filling in for her regular physician gave her the wrong medication. "If they have the thing right there, they can pull (the prescription) up," she said. Brown is trying to teach its students to do a better job of interviewing patients and recording the results, Frazzano said. The university has designed a special software program for Palm handhelds that helps walk students through their interviews by asking about patients' vital signs, medical history and family. "They're starting to get the idea of checklists — I need to know these things," Frazzano said. The students also download their entries from their PDAs into a computer at Brown, allowing medical school faculty to track their training. "If we find out students are not doing enough physical exams or not seeing enough patients — say students are not seeing enough women or patients over 65 years of age — we could take steps to alleviate that situation," Frazzano said. 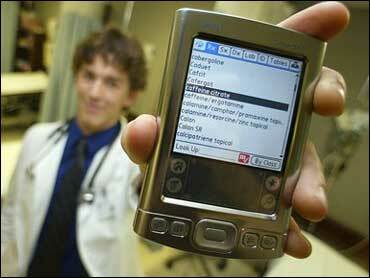 Brown medical student Rajiv Kumar, 22, stores anatomy flash cards on his Palm Treo 650. "I can actually use it as a study tool when I'm not home with my book," he said. The cards, which show diagrams of various body parts, also come in handy during discussions with patients. "If I'm explaining something to someone — a patient or just a friend — I can just pull it up and show them the part of the body," Kumar said. Melissa Vandette, 26, a nurse at Miriam Hospital in Providence, said she was a "paper and pencil list" person until she enrolled in URI's master's program and was forced to get a Palm Tungsten. Now she uses it daily to pull up drug, diet and other information while at patients' bedsides. "To have that computer at your fingertips is so helpful," she said. "When a patient is asking you a question, you don't have to say, 'Well, let me go find out and I'll get back.'"